From the author of the Printz Honor Book STOLEN, the highly anticipated thriller about deadly games played in the dark. Wow. Well, I went into this book expecting a “meh” read after seeing a lot of reviews that called The Killing Woods “just okay”. I am so glad that I still read the book, as I was completely immersed into the creepy tale. And while I know that The Killing Woods won’t work for everybody, I absolutely loved the book. Lucy Christopher’s writing style was what initially drew me into the book. It’s gritty and compelling in a way that had me gobbling up the words. I am also glad that Emily and Damon, who alternate POVs, had very distinguishable voices. I read the Killing Woods in one night. I just had to know what happened to Ashlee, and the answer wasn’t one that I predicted. I love when a mystery isn’t easy to solve. I also kept reading because of the predicament of Emily’s father. It is obvious that he needs serious help, as the war he was in a few years ago severely messed with his head. I was so torn about what to think of him. When you have someone who is mentally ill, it is hard to be absolutely positive of what they are and are not capable of. My favorite scenes were spent in the woods, where Damon often played a deadly game. I won’t tell you much about the game, except that it plays a pivotal role in the book. The game was very dark... and pretty twisted. Also, the scenes were written so well, that I was experiencing the game along with our protagonists. Finally, I will go into detail about the characters. I thought that they were both well-formed and not your average YA cliches. Emily was easy to like and sympathize with, and I liked how she was determined to prove everyone wrong about her father, but wasn’t always afraid to let any doubt show. Then, we have Damon. He was one of the most interesting characters I have ever read about. I initially thought I wouldn’t like him, until I realized he was just a lost teenager. 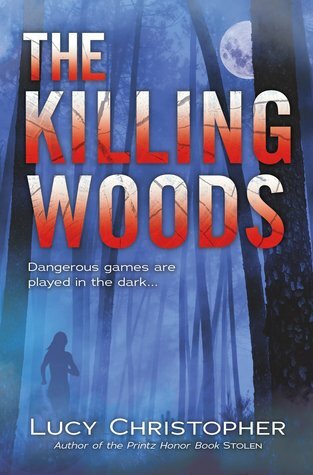 Overall, The Killing Woods exceeded my expectations in every way. The characters were dark and troubled and sympathetic, yet I loved the resolution they each got at the end. The setting and writing was breath-takingly disturbing. This book is the perfect halloween read, and great for readers looking for a dark, different read. That was a fantastic review. I cannot wait to read it. I am always looking for a good "thriller" to read! Thanks for bringing this one to my attention!